I was honoured to have four of my paintings shortlisted for Wildlife Artist of the Year 2018. The paintings, ‘Mandrill’, ‘Red Panda’, ‘Snow Leopard’ and ‘Tiger’ were exhibited together. This yearly competition is organised by the David Shepherd Wildlife Foundation and brings together myriad forms and media from many of the most accomplished artists worldwide. Half of the proceeds of sale go towards helping the valuable work of DSWF. 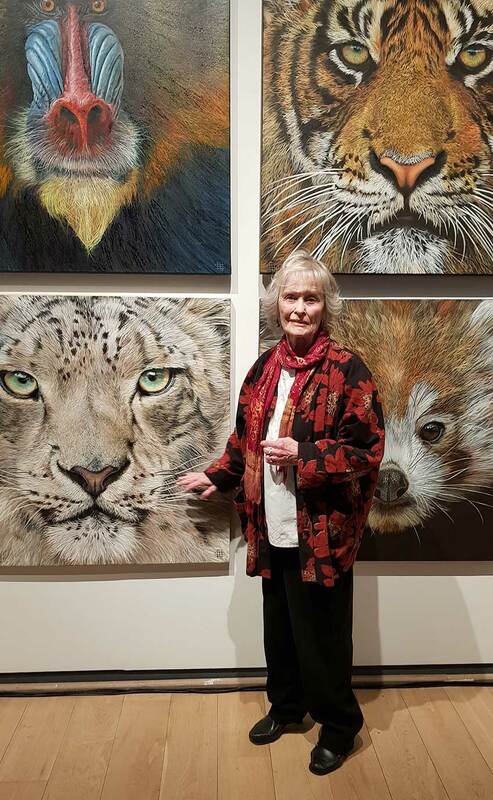 The inspirational Virginia McKenna, co-founder of the Born Free Foundation.